Yeah Laura the two rooms above the fish are the makeover of the orange room. I kinda like the white fish on the mantel. I have to say...I don't love fish but have three fish platters prominently displayed in our kitchen. Hmmmmmmmm. i like the room white better! much prettier I think. great furniture in there too. dont like the fish though. eek. Creamy, dreamy whites... Ahhhh!! Your little fish friend matches the before room. Did he get a coat of white, too? hehe. You are a crack up. Hum...it is clever and neat...but for some reason not exactely the sort of house I would dream of. There is something missing for me. i go straight for this little guy! well....it's nearly lunchtime here and it looks so fresh ! I love the white fish on the fireplace - that is really cool! And the huge basket of driftwood. Really neat. Gorgeous! It's amazing what a can of paint can do! I think it looks amazing! 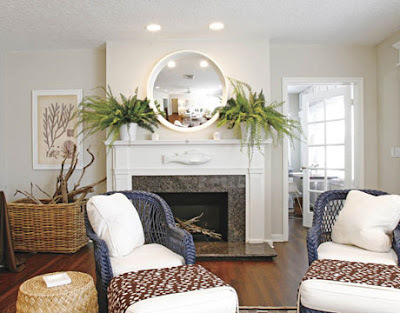 I love the mirror above the fireplace and those ferns. So cool! 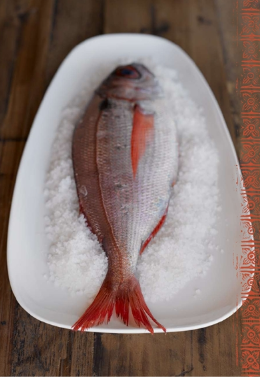 Do you remember Molly's reaction to the fish on the mantel at the condo? I had to move it!!! The tribute to the ponies was wonderful. I could just move right into that 2nd picture. I'm relaxed just lookin at it! I LOVE it....it's very fresh and clean! Fresh and airy. . .and the fish caught me paying attention. You know I love white rooms! But then again, anything you do will be gorgeous. Thanks for the comment on the shell mirror! If you'd like one just let me know and I will make it just for you :) I must say, I think shells would work nicely in your home! haha! loved that last photo! I was wondering.... then I read that you were keeping us on task! 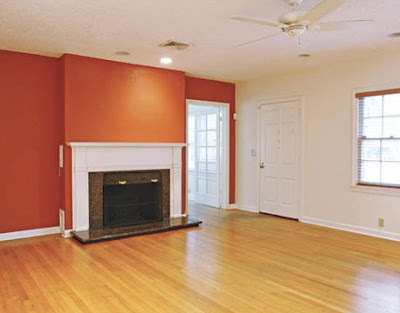 I like the orange, it is different, refreshing for a beachy home. Not sure I could do it, I like the white like Côte de Texas better. They tell me I need 3-5 servings of fish per week, so please post more. you are too cute !! lol, thx for the good laugh!! So what does this mean?? Love the little fishy and ...ok it is a little random....but I love random, xv. P.S. your blog is such refreshing. Every time I visit I feel like I'm back to my childhood days in the tropical. Yep, I was paying attention! What a transformation. The great use of the driftwood pieces caught my eye. I used to love wild punches of bold color. 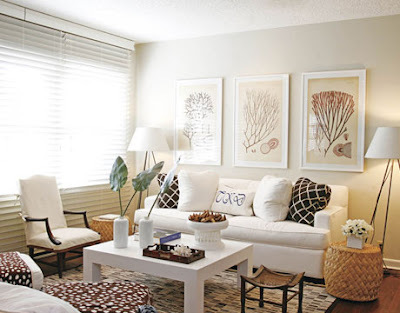 Now, I love the simplicity of whites and creams and monochromatic schemes. (ooooh that rhymes). Nemo on salt - very lip smacking French! Yum-meeeeee. Fun room, but felt odd with the wicker. Great ferns. Free Furniture next week....all the coffee tbale wood you can stand - if I take the winning powerball.